Understand FCC Chairman Ajit Pai’s history prior to the FCC, his record so far, and his priorities for his term by ordering your copy of this FREE special report today. 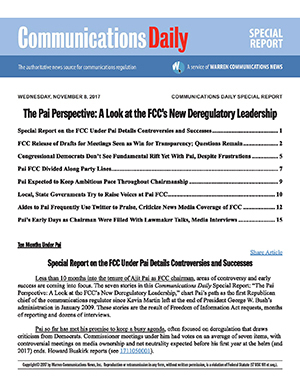 Communications Daily is required reading for senior executives at top telecom corporations, law firms, lobbying organizations, associations and government agencies (including the FCC). Join them today! FCC Media Bureau promotes Holly Saurer to deputy bureau chief, announces Paul Jackson, ex-House Commerce Committee, rejoins commission as associate bureau chief ... Colorado Office of Information Technology’s Broadband Office names Teresa Ferguson, from Colorado Public Utilities Commission, broadband program manager ... Freeform appoints Lauren Corrao, ex-Tornante TV, executive vice president-original programming and development ... CBS names Jose Andino, ex-Mediapro US, to the newly created senior vice president-human resources, CBS News ... E.W. Scripps hires Jim Doty, ex-WJAC-TV, Johnstown, Pennsylvania, as vice president and general manager-director of sales at KERO-TV, Bakersfield, California. Society of Broadcast Engineers announces that RJ Russell resigns as vice president, anticipating his company, Technical Broadcast Solutions, will be hired for an SBE project; Secretary Wayne Pecena fills remaining term; executive committee member Kevin Trueblood becomes secretary; Jason Ornellas becomes executive committee member and Steve Brown a board member. Lobbyist registrations: Music industry digital tech firm Jammber, First Rule on implementation of the Music Modernization Act and Copyright Office FY 2020 appropriations, effective April 8 ... Hyperloop, First Rule, effective April 1 ... Microsoft, Hobart Hallaway, effective April 1 ... Chinese telecom equipment manufacturer Huawei, Jones Day on “foreign investment, government purchasing, and security-related issues arising under the National Defense Authorization Act,” effective March 27 ... Digital Systems Group, Van Scoyoc Associates, effective March 22 ... CTIA, Ervin Hill Strategy on 5G and spectrum policy, effective March 25 ... IDT, Twenty-First Century Group on IP captioned telephone service and the Electronic Benefits Transfer program, effective March 15 ... NCTA, Ferox Strategies, effective March 15 ... healthcare tech firm GetWellNetwork, Jefferson Business Consulting, effective March 4 ... industrial IoT developer Camgian Microsystems, Cornerstone Government Affairs, effective March 1 ... Charter, Akin Gump, effective March 1 ... Comcast, Akin Gump, effective March 1 ... CTIA, BGR Government Affairs, effective March 1 ... Fox, The O Team on Satellite TV Extension and Localism Act reauthorization, media ownership, online privacy and other issues, effective March 1 ... Garmin, Hobart Hallaway, effective March 1 ... High-Tech Inventors Alliance, David Jones on IP and patent legislation, effective March 1 ... Ivanti, Bridge Public Affairs, effective March 1 ... The MIL Corp., Strategic Marketing Innovations on unmanned aerial vehicles, effective March 1 ... SAS Institute, Miller Strategies on IT modernization and federal data programs, effective March 1 ... Twilio, on its own behalf, effective March 1 ... education tech company 2U, Gonring, Spahn, effective Feb. 28 ... American TV Alliance, Harris Wiltshire, effective Feb. 25 ... Better Identity Coalition, Venable, effective Feb. 25 ... software firm Kamine Technology Group, Greenberg Traurig on “issues related to technology involving data collection and analysis of disability claims,” effective Feb. 21 ... advanced networking equipment manufacturer Fuse Integration, Flagship Government Relations, effective Feb. 18 ... wireless equipment manufacturer MaXentric Technologies, Flagship Government Relations, effective Feb. 18 ... Pacific Antenna Systems, Flagship Government Relations, effective Feb. 18 ... McAfee, Blank Rome Government Relations, effective Feb. 11 ... L3 Technologies, DLA Piper, effective Jan. 4 ... electronics retailer B&H Foto & Electronics, Stonington Global on remote sellers tax, effective Jan. 1 ... Ride TV Network, Capitol Resources, effective Jan. 1 ... SmallSat Alliance, Innovative Federal Strategies, effective Jan. 1 ... Ultra Wide Band Alliance, 121 Strategies & Government Relations on the 6 GHz band, WiFi and “spectrum efficiency, effective Jan.1 ... Zebra Technologies, 121 Strategies & Government Relations, effective Jan. 1.